For the #NeverTrump-ers, yesterday was a rare day of good news. We finally got a new poll of Wisconsin, and it showed Trump at 35%, trailing Cruz’s 36%, and several points behind Trump’s national average of 44%. Even before this poll dropped, the betting markets already viewed Cruz as the favorite in Wisconsin. Yet, the markets still view Trump as the overwhelming favorite to become the nominee. PredictWise currently views him as 79% favorite, which is where he’s been hovering for weeks. Trump can still win Wisconsin, he can win delegates in Wisconsin despite losing the state, he can make up for the delegates lost later, he can still win on the first ballot (or later ballot) if he falls short of 1,237 pledged delegates. PredictWise currently believes he has a 41% chance at winning the state. For some perspective, those odds aren’t much lower than Stephen Curry making a wide open three-point shotand are higher than Ted Williams getting a hit in 1941. Even if he loses the state-wide vote in Wisconsin (and the 18 statewide delegates that are given to the winner), he’ll win some delegates. Assuming he narrowly loses to Cruz, he could carry three to five of Wisconsin’s eight congressional districts. Each CD is a Winner-Take-All election worth 3 delegates, so Trump could end up with 9, 12, or 15 delegates even while losing the state overall. If Trump narrowly wins the state, he’d probably get 33 or 36 delegates, so we’re talking about 18-27 delegates at stake. Trump can make-up for those 18-27 delegates lost in Wisconsin but running up the score in New York (April 19 | 95 “Winner-Take-Most” delegates), Connecticut (April 26 | 28 WTM), Maryland (April 26 | 38 WTM), and Rhode Island (April 26| 19 proportional), which have a combined 180 delegates. With Cruz’s limited appeal in this region and Kasich’s bumbling campaign, Trump winning big in the remaining Northeast states is increasingly likely. Indeed, the newly released markets think he’s an 88% favorite in NY, 76% in CT, 74% in DE, and 71% in in MA, and 78% in RI. Or he can make up for a loss in Wisconsin with a surprise win in any one of Nebraska (May 10 | 36 WTA), Montana (June 6 | 27 WTA), or South Dakota (June 6 | 29 WTA). While these three states are in the midwest/Big Sky region, which is where Trump struggles the most and Cruz does his best, they are relatively strong Trump states according to Nate Cohn’s national map of Trump support. Trump has decent odds of carrying one of these states. That same map from Cohn also shows Trump polling stronger than expected in Oregon (May 17 | 28 proportional), Washington (May 24 | 44 WTM), and New Mexico (June 7 | 29 proportional). If Trump does well in those states, he could offset a loss in Wisconsin. 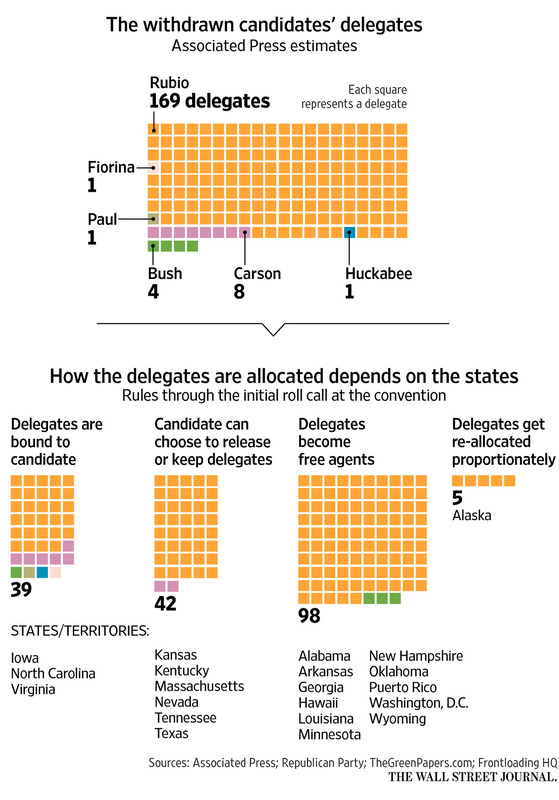 Trump doesn’t need 1,237 delegates at the end of primary elections to become the nominee. Between the end of the primaries on June 6 and the beginning of the Republican Convention on July 18, there are six weeks for each campaign to lobby all the unbound delegates to come their way. After voting is over, there will be 106 unbound delegates to work with. There will also be another 98 delegates who were pledged to candidates that have since dropped out, but are now free to support whichever candidate they prefer. That means there will be over 200 unbound delegates for Trump to showcase his “Art of the Deal” superpowers. If Trump wakes up on June 8 with 1,236 delegates–one short of a majority–he’s all but certain to convince one of those 200+ unbound delegates to support him. If he instead wakes up with 1,100 delegates, he’ll struggle to convince 137 delegates, especially since in this scenario he must have stumbled down the stretch with some surprising losses. Taken together, these four points explain why the betting markets remain so confident about Trump’s chances. He can still win Wisconsin, he can still win delegates in Wisconsin despite losing the state, he can make up for the delegates lost later, and he can still win if he falls short of 1,237 pledged delegates.